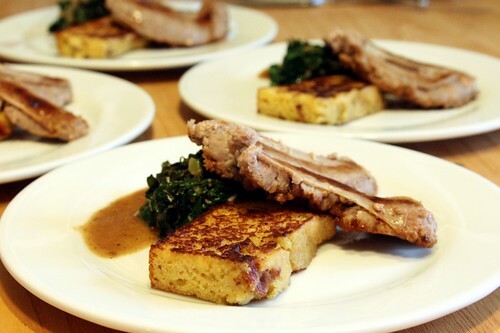 fresh garlic sausage with sauteed kale, pan-seared bacon cornbread, and thyme sawmill gravy, originally uploaded by aarn! +16th December, 2009+. stuffed some garlic sausage the night before (with vadim and peter), with pork scraps (from last weeks butchering extravaganza), olive oil poached garlic, garlic powder, fresh garlic salt, pepper, and thyme. cooked the sausage in a skillet with a few drops of vegetable oil until both sides were brown, then sliced in half and seared them, cut side down, in the skillet until lightly browned. removed the sausage from heat and set aside, covered. soaked some kale in cold water, dried, and sliced into thin strips. sauteed two finely chopped shallots in 2T. butter, with a pinch of salt, pepper, cayenne, and mustard powder, until tender, then deglased with 1/2c. chicken stock and let reduce slightly. added kale, and sauteed until tender, then removed the pan from heat and added 2T. of sherry vinegar, tossed and let sit until ready to plate. had some leftover reinhart bacon cornbread from the night before. sliced the cornbread into 3/4 pads, smothered in butter and seared in a dry sautee pan until brown and crisp. added 1T. of lard to the skillet (still containing the drippings from the sausage), and put it back on heat. poured 1c. of chicken stock into the skillet, with a pinch of salt, pepper and a few sprigs of thyme. put about 1T. of flour into the skillet and stirred constantly until thick. poured the gravy through a sieve and discarded the bits.